In the southern part of Ghana, the tonal language of Twi is spoken. When Twi is drummed, the resulting drum language is called ayan.1 We are going to learn more about an ayan drummer who goes to school in the town of Akropong. We will hear him play his drums, and then learn how to play the phrases with him. His name is Frederick and he was kind enough to demonstrate his drumming for Dr. Cati Coe on her trip to Ghana in 2005. Many thanks to Dr. Coe for sharing this with us, so we can experience one of the ways Ghanaian students practice their cultural studies in school. Notice that Frederick has two atumpan drums. To hear how they sound, simply click your mouse on the top of each drum! As you can hear, one plays the high tone and the other plays the low tone. 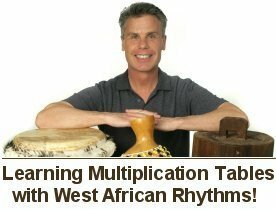 He plays his high and low drums to match the high and low tonal patterns of his language, Twi. In Ghana, many schools no longer use bells to signal the beginning and ending of class periods and recess, instead they drum phrases in their language. Everyone at Frederick's school understands the words he is drumming because he plays the words in the context of well known phrases. The first example is for Assembly. The Twi phrase that Frederick drums is "Kɔtɔkɔ, mommra." In English this translates to "Everyone should come." The students hear this phrase in the morning and also after recess when it's time to go back to class. The second example is for Closing. The actual phrase is "Yeda w’ase, Akudɔnto." In English this translates to "Thank you very much." Students at Frederick's school hear this phrase at the end of the school day. With both examples, just press the play button to hear Frederick. You will also notice that Phil transcribed Frederick's phrases into musical notation to help you learn how to drum them. You may also play Frederick's phrases on Phil's free multimedia activities — they're near the bottom of the page. Now have fun! 1) Assembly: "Everyone should come"
Kɔtɔkɔ, mommra (L L L, H H L) "Everyone should come"
2) Closing: "Thank you very much"
Yeda w’ase, Akudɔnto (L L L L, L H L L) "Thank you very much"
See and hear Frederick's drum phrases played on Phil's free multimedia activities.